Cars have always been the ultimate music video prop. The picture above sums it up – Kylie in a De Tomaso Mangusta for Can't Get You Out Of My Head, though the video didn't quite make our top ten. Let us know in the comments section which car-themed music video you like best. There are plenty to choose from! Sheryl Crow's 2002 homage to Steve McQueen naturally features a Highland Green Ford Mustang, a Porsche 356 Speedster and more, as she recreates scenes from McQueen movies. The surprise is that the video to Steve McQueen also includes a Ford GT40 towards the end of the video. In fact, it turns out that the GT40 is a good replica but the driver is none other than NASCAR legend Dale Earnhart Jr. The funny thing about the 1981 video for The Human League's Don’t You Want Me is that the Rover SD1 and Saab 99 Turbo that are featured would have been new at the time. Now they're as rare as the more usual music video Ferraris. You just knew there would be some Jamiroquai videos in here, didn't you? There are several to choose from but the video for Cloud 9 is great for the Ferrari 275 GTB and Mercedes 280 SE. 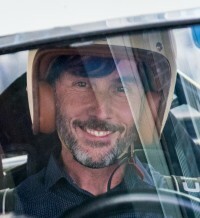 Oh, and don't forget White Knuckle Ride, which features petrolhead Jay Kay in a chase between a helicopter and a very sweet Porsche 911 Carrera. It seems an unlikely choice, but for the 1985 video to Everybody Wants To Rule The World, Tears for Fears chose this 1964 Austin-Healey 3000 Phase 2 Series III (BJ8). It’s shown being driven through rural Southern California by singer Curt Smith. It’s easy to get carried away with the muscle cars and supercars of your typical car-themed music video, but few cars get such a starring role as this 1959 Morris Minor Tourer. The ‘Maddiemobile’ features throughout the 1982 video for Driving in My Car, and at one stage the Minor drives past pop group Fun Boy Three trying to hitch a lift. Even better, at the end of the video for Say You'll Be There there's a brief appearance by a rare Chevrolet Corvair Rampside pick-up truck! Gorillaz may be a cartoon band but the cars featuring in this 2010 video for Stylo are real – a 1969 Chevrolet Camaro and a 1968 El Camino. Calvin Harris' 2012 video for We’ll be Coming Back also features an early Porsche 911 driven by fellow petrolhead Example, which makes it twice as good. The Ferrari 512 looks fantastic though, and Calvin Harris admits the idea of the video was simply to ‘look cool’. Job done, thanks to the cars. The ZZ Top Eliminator hot rod also features in the videos for Legs and Sharp Dressed Man but its best appearance is for Gimme all your lovin'. The 1933 Ford Coupe hot rod also features in our Top 10 greatest ever hot rods. Jay Kay’s love of cars really shone through in the 1996 video for Cosmic Girl, which featured a Ferrari F355 Berlinetta, Lamborghini Diablo SE30 and Ferrari F40. With Jay driving the Diablo we’ve given it top billing, though all three cars receive equal amounts of screen time. These cars haven't been in music videos but they've all got equally famous owners. Check out the Top 10 celebrity car collections!